You have many options for changing the title, tagline and other general settings for your site. You can find these settings on your dashboard under the tab Settings > General. Title: This is the name of your website. Depending on what theme you choose, this title will likely be displayed near the top of the page. It will also be displayed in the title bar of your web browser. Tagline: This is your site's tagline or slogan -- a sentence or short description of what your site is about. You are not required to have a tagline for your site. Email address: This is the email address associated with the administration of your site (i.e., a comment to a blog post has been submitted and needs to be moderated; the "from" address in the email that is sent out when user accounts are created). This email address is different than the one associated with your Administrator account. However, you can, and likely should, use the same email address for both of these. Timezone: If the "posted on" date that is showing up next to blog posts and comments is incorrect, it is likely your site has the wrong timezone selected. You should select your own timezone under this setting. Selecting a city is a little easier to remember than a UTC timezone, so we recommend choosing "New York" as your closest city. Date Format, Time Format: You can choose the style in which dates and times appear on your site. This will be reflected on the public view of your site, but not the administrative screens (i.e., what you need to be logged in to see). 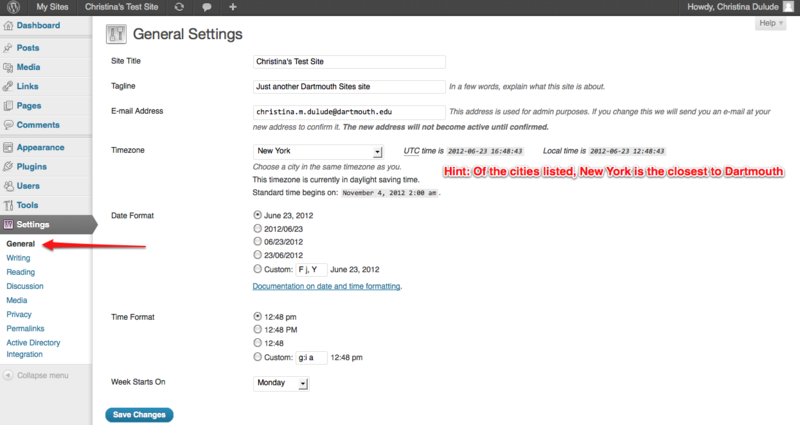 Week Starts On: This is your preferred start date for WordPress calendars, if you use this widget on your site. Monday is the default setting for this drop-down, meaning a monthly calendar will show Monday in the first column. If you want your calendar to show Sunday as the first column, then select Sunday from the drop-down.